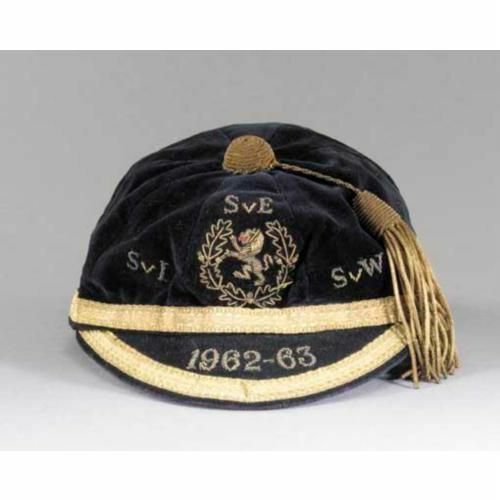 Scotland Football Cap Bill Brown's Scotland cap v Ireland, England and Wales 1962-63 season. William Dallas Fyfe Brown was born at Arbroath 8th October 1931. He excelled as a goalkeeper in schools football & represented Scotland at Schoolboy & youth international level, before graduating through the 'B' team to win a total of 28 full international caps between 1958 & 1966. His record as the most capped Scottish goalkeeper was finally passed by Allan Rough, and he is many commentator's idea as the best Scottish international between the sticks in the post-war era. He was signed by Dundee in 1949 and won a Scottish League Cup medal in 1952 before he was transferred to Tottenham Hotspur for &#163;16,500 in June 1959. At White Hart Lane he was the keeper during the 1960-61 double-winning season and won a further FA Cup winner's medal in 1962 & a European Cup Winners' Cup medal the following year. After his Spurs playing days, Bill Brown played a season at Northampton Town before moving to Toronto where he played for the Falcons. After his retirement from football he worked in real estate in London & Toronto. In the Home International Championship of season 1962-63, Scotland proved the outstanding team winning 3-2 in Cardiff, beating Northern Ireland 5-1 at Hampden and then recording a 2-1 win over England at Wembley. Sold for &#163;960. (c) www.sothebys.com Photograph courtesy of Sotheby's Picture Library.